Buggy Barn Crazy Camp Retreat Arrive Friday April 20th. Stay until Sunday around 3 pm. Check out our retreat calendar. Your group can reserve the retreat center any time that is not booked! Spring has finally sprung! We hope this finds you gearing up for a wonderful Easter celebration. My kids absolutely love to hunt eggs and look forward to this time almost as much as Christmas. Here at Quilt Mercantile and Quiltagious Quarters we are very excited that April has arrived because we have Pam and Janet from Buggy Barn coming in just TWO WEEKS! If you have been trying to make a decision---Come join the fun. Their new book Positively Crazy was a huge hit at the Dallas Quilt show this year. Several ladies came back over to our booth to tell us that it was the cutest thing they saw during the whole quilt show. The Buggy Barn crazy method is one of a kind. It is fast and fun once you learn how they do that "crazy stuff." You will love meeting these wonderful ladies. We have five openings in the class on Friday April 20th and six openings in the retreat for that weekend. This is their only trip to Texas in 2012 and a great opportunity to learn a very fun piecing method! Click here to find out more. We now have our two new block of the month projects hanging in the store. They made their debut at the Dallas Quilt Celebration quilt show. We are offering these as a monthly packet or we also have them in complete kits. Raining Cats and Dogs and Stonehenge Meets Jamestown are both pictured on the store website. Click here or on the link at the bottom of this e-mail. For those of you who love floral, we have made a very small number of the Ramblin' Rose BOM using the same pattern layout as the Stonehenge BOM. These are not listed online. We all know that Spring means--Spring cleaning. Cleaning out the house and opening the windows to let the fresh air in can be very refreshing. Have you given your sewing machine any thought? Your sewing "partner" has worked hard for you all Winter long. I bet if you stop and think about it---you haven't had your machine cleaned in over a year (maybe longer). It is true that you can get in there and clean out the lint in all the areas that you can see in the bobbin case. What about all the mechanical parts that are hiding under your machine hard case? It is very important to keep all of those hard working parts clean and lubricated. At our store we are only qualified to service and clean the Elna (or Janome) sewing machines that we have stocked and sold in our store. BUT we are happy to announce that we have found a wonderful place for you to have any of your machines serviced (even the featherweights). Ernesto Tames has been servicing all types of machines in the McKinney area for over 25 years. If you mention that Quilt Mercantile sent you--you will receive 25% off (computerized reg. $99.95) during the month of April. Now that is a great deal! Located behind McDonald's on I75 in McKinney. Call 972-548-1400 or visit www.advanced-sewing.com. We are able to set appointments for him to come pick up machines if you are not in a big hurry. While planning your Spring and Summer, make sure to include learning a new method or refining your skills. Quilters are the best people! Spend time in a class or on a retreat enjoying this wonderful creative hobby. Below is our remaining April class offerings. New schedule will be out soon. Check our retreats also. The website is not yet full of information on the ones into the future but we want to let you know they are coming up! Make sure you notice the dates the quilt store will be closed. We are starting a new tradition this year. After ten wonderful years of being in business, we want to help insure we can stay open and excited to be here for another ten years. SO....we are going to have a week of "independence." Every year during the week of July 4th--We will be closed. Since most of you guys will be out and about on vacations etc., we feel like this is a time that we can join everyone across the country in celebrating the freedoms we enjoy in this great land! Beginning Quilting Sat. April 21st (9:30-4 for $35). This class will take you from cutting to binding in one six-hour class. We will cover rotary cutting, simple piecing, borders, making the sandwich, machine quilting, squaring the quilt, and binding. What’s the catch? The project will be a candle mat or table topper. The only way to experience a “quilt-in-a-day” is to make a very small quilt. I will share a wealth of quilting knowledge and tips with you as you make this small project. This is for students who are truly beginners and need an introduction to our craft. Tell your non-quilting friends so they can become quilters too! Need one more student for this class to make. Kindergarten Machine Quilting Sat. April 28th 9:30-3 for $30. Do you just make tops? Is the cost of having everything quilted for you stifling your creativity? This class teaches you the basics of machine quilting. Straight line, free form, quilt-in-the-ditch, outline, grid, channel, and stipple quilting will all be covered, plus basting, marking and binding. Come learn how to finish your entire project yourself! We have three available spots for this class. Level 1: Basic Pantograph Long Arm Quilting class April 18th, or May 1st, 9:30-3:30 for $150. Learning to stitch a pantograph pattern on your quilt is an easy and fast way to make your quilt look like you had a professional quilted it. The basic steps will get you started on learning how to put a nice pantograph design on your quilt. Jackie will teach the six steps to get started becoming a confident long arm quilter. Level 2: Custom long arm quilting class Wed. April 25th, or May 16th, 9:30-3:30 for $200. Would you like to learn how to make your quilts stand out with some custom quilting? This class will teach you the basics of custom quilting. It’s fun and you can use your creative mind to enhance your quilt. You can say you quilted it and had fun doing it. Jackie will teach seven steps to get started becoming a custom long arm quilter. Level 3: Artistic Custom Quilting class Wed. April 11th 9:30-3:30 for $250. After completing Level 1 and Level 2 classes you are now on your way to Artistic quilting. This class will take you to the level of a professional quilter, with lots of practice, patience and determination! You can make your quilts stand out in a crowd. Your family and friends will ask if you had a professional quilt it, and you can proudly say, “I quilted it”!! Jackie will teach the six steps to getting started to becoming a Artistic Long Arm Quilter. Pre-registration is a must. Classes must be paid in full at time of registration unless otherwise noted. We consider your enrollment to be a commitment by you to the teacher. Class fees will only be refunded if we are notified seven days before class date. Make checks payable directly to the teacher. Please do not bring children or guests to class. Only paying participants are allowed to stay all day in the classroom area. Please park in spaces next to Highway 69. Unloading only by the store. Be sure to pick up the items on your supply list prior to class so you can be prepared with supplies and fabrics. Be ready to learn and have fun! 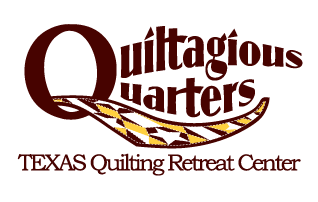 Click Here to visit Quiltagious Quarters!